Knowledge is infinite. Life is a continuous process of learning. The series of Trivia Collections gather knowledge from different subjects. If you are eager for knowing more about the world, this Trivia Collections could best suit your interest. Including 100 Q & A with informative explanation, you can learn about the common knowledge as well as something you seldom think about. 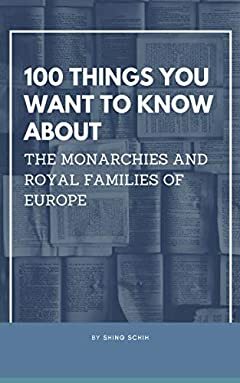 This volume is about 100 facts about the royal families that you must be interested in. Take this quiz and gain a deeper insight into the web of royal families that have historically ruled the European continent extending to the Russian empire. This ancient system of political rule often involved hereditary reign with sovereignty being passed on from one member of a royal family to another. In some cases, this system continues today in monarchies such as the United Kingdom and The Netherlands, although their reign has become limited by the country’s constitution to that of a figurehead. Several of these monarchies were abolished during the first and second world wars of the 20th century, in many cases with shocking consequences for the members of the royal families. Some assassinations were even considered to be the catalyst for some of the worst wars the world has seen to date such as the Archduke Franz Ferdinand and the First World War. How much knowledge do you possess about the intricacies and intertwining relationships of the sovereign European rulers of past and present? From the modern day Royal families of England and Monaco to the abolished monarchies of Eastern Europe, this quiz explores key countries, events, figures, facts, and timelines from the early centuries up to today’s existing monarchies around Europe.